“Years ago I thought I was the brightest guy in the world. Then I met von Neumann and Feynman. In recent decades I've settled for greatest name-dropper. Then I found Bemer's sites!! Best to just shoot for crankiest? Or at least, crankiest nonagenarian”. Herb is featured on this site because, with Wallace Eckert, he was one of the principal instigators of automated machine computing and computer science at Columbia University as an IBM Watson Lab scientist and Columbia faculty member, 1945-1950. In 2003 Herb noticed my history and we began a voluminous correspondence that lasted until his death; he has made countless contributions to this site as you can see by putting "grosch" in the search box on the main history page (or just click here). Herb was a human encyclopedia; not only had he been everywhere and done everything, he remembered every detail: people, machines, events, organizations, programming techniques from the dark ages, every IBM machine and model over a span of half a century. He was generous and candid with his knowledge, which he passed on with a self-effacing sense of humor, and, it must be said, he was a deep and sincere appreciator of women, a rare quality even to this day in persons of his gender. As can be seen from his autobiography, he led an extraordinarily full life, and was remarkably open about his failings. Click on the image strip at the top to see a gallery of personal photos. Organizing and labeling these (and many others not yet shown) was a project he wasn't able to complete. PhD, Astronomy, University of Michigan, 1942. Watson Scientific Computing Laboratory at Columbia University, 1945-1951. Charter Member, Association for Computing Machinery (ACM), 1947. Giver, Grosch's Law (1950): "Computing power increases as the square of the cost." President, American Rocket Society (now American Institute of Aeronautics and Astronautics), 1951. Lecturer, Cavendish Laboratory, Cambridge, UK, 1954. First Manager of IBM's Space Program, 1958-59. Director, National Bureau of Standards Center for Computer Sciences and Technology (now NIST Information Technology Laboratory), 1967-70. Fellow, British Computer Society (now The Chartered Institute for IT), 1959. Editor, Computerworld , 1973-76 (26 Jul 1967 V1#2 COVER). President, Association for Computing Machinery, 1976-78. Professor, Columbia University (1946-51), Arizona State College (now University) (1956), Boston U (1972), NMSU Las Cruces (1994), UNLV Las Vegas (Distinguished, 2002), Institute for History and Philosophy of Science and Technology, University of Toronto, (2003-2008). At Columbia, Grosch designed and taught one of the world's first computer science courses, Engineering 281: Numerical Methods, beginning in 1946. Maxwell, Allan D. and H.R.J. Grosch, "Elements and Ephemeris of Delaporte Object 1936 CA", Publications of the Observatory of the University of Michigan , Vol.6, No.11 (1937). Grosch, H.R.J., Integration Orbit and Mean Elements of Jupiter's Eighth Satellite , Ph.D. dissertation, University of Michigan (April 1942). Grosch, H.R.J., and J.E. Willis, "Positions of Pluto", Astronomical Journal , Vol.50, No.14 (June 1942), pp.14-15. Grosch, H.R.J., "Ray Tracing on IBM Punched Card Equipment", Journal of the Optical Society of America , Vol.35, 803A (1945). Grosch, H.R.J., Bibliography on the Use of IBM Machines in Scientific Research, Statistics, and Education , IBM (1945). Grosch, H.R.J., "Harmonic Analysis by the Use of Progressive Digiting", Proceedings of the 1946 Research Forum , IBM (1946). Grosch, H.R.J., "The Orbit of the Eighth Satellite of Jupiter", Astronomical Journal , Vol.53, No.180 (1948) (a condensed published form of Grosch's 1942 Ph.D. thesis). Grosch, H.R.J., "Ray Tracing with the IBM Selective Sequence Electronic Calculator", Journal of the Optical Society of America , Vol.39, 1059A (1949). Grosch, H.R.J., "Multiplication of Small Matrices", IBM, New York (1 Jun 1949). Grosch, H.R.J., (ed. ), Proceedings of the 1948 Scientific Computation Forum , IBM (1950). Grosch, H.R.J., "The Use of Optimum Interval Mathematical Tables", Proceedings of the 1948 Scientific Computation Forum , IBM (1950). Grosch, H.R.J., "Bibliography on Chebyshev Polynomials and Their Use as Optimum Approximation Functions", Proeceedings of the 1949 Scientific Computation Seminar , IBM (1951). Grosch, H.R.J., "A New Level of Instruction in Celestial Mechanics", Astronomical Journal , Vol.63 (1958). Grosch, H.R.J, Computer: Bit Slices of A Life (first edition), Third Millenium Books (1991). [C.1 Panel | Computing Economies: Revisiting Grosch's Law, 10th Annual SIGCIS Conference, St. Louis MO, 14 October 2014]. Go away kid you bother me, Allan Olley, 21 January 2011 (IT History Society). Association for Computing Machinery Obituary, January 29, 2010. Herb Grosch, IT History Society, Paul Ceruzzi (2010). Computer: Bit Slices from a Life , 3rd Edition (2003, full text online). 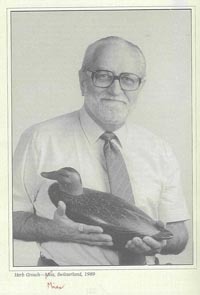 Herbert Reuben John Grosch, IEEE Computer Society Computer Pioneers (1995). Brennan, J.F., The IBM Watson Laboratory at Columbia University: A History, IBM (1970). A Conversation with Herbert R.J. Grosch (ACM Ubiquity, December 2001). Von Neumann versus Watson Sr. (Herb Grosch ACM Lecture, January 2003). Gardner, W. David, "Author of Grosch's Law Going Strong At 87", TechWeb News , 12 April 2005. Computer Pioneers video (Herb Grosch at minute 43). July 15, 1970 (PDF, 36 pages). August 24, 1970 (PDF, 66 pages). August 26, 1970 (PDF, 72 pages). August 28, 1970 (PDF, 46 pages). November 9, 1970 (PDF, 47 pages). March 30, 1971 (PDF, 129 pages). May 7, 1971 (PDF, 78 pages). Herb Grosch and friend with IBM 701 (1956). Watson Scientific Computing Laboratory at Columbia University 1945-1970. Columbia University Computing History (the sections from 1945-1950).